After nearly a month of regular season play, the Denison men’s soccer team appears to be on the legendary path. Following a 2-0 shutout victory against Heidelberg this Saturday, the Big Red have improved their overall record to 7-0-1. The team has shown they are a force to be reckoned with, winning seven consecutive games after a double overtime 0-0 tie against Washington and Lee at the end of August. Wednesday night’s matchup at home against Capital was a anther feather in the cap as well. While Capital put the first points on the board with 13:12 into the match, Denison’s first year Quinn Miller connected with the back of the net only three minutes later, tying things up 1-1. Capital clearly was not ready to relinquish their lead, as they scored for the second time just 22 seconds later. However, junior Mark Waterman would capitalize on a free kick from just outside the 18 yard box to tie the match for the second time. The second half of the game was a back and forth battle. Neither Capital nor Denison were able to get the ball past their opponent’s keeper. Denison’s senior goalie Matt Wagner had a particularly impressive second half, coming up big with two quick saves following a Capital corner kick roughly 15 minutes into the second half. Denison nearly took the lead with under ten minutes remaining. Senior Jamie Wagner placed the ball perfectly in front of the goal after a corner kick, though fellow senior John Krentz missed the target with a wide right header. Two minutes later, a foul on Capital would give Denison another chance. This time, senior Will Krentz attempted to break the tie with another header, though Capital’s goalie Bob Weisgarber blocked the shot. After 90 minutes of play, Capital and Denison would head into overtime. Capital attempted to end the game quickly, though Denison’s Wagner had different plans, saving Capital’s only shot on target 49 seconds into overtime. Denison’s Miller gave the Big Red their first chance at victory, though his first header was unsuccessful. He would quickly redeem himself, perfectly placing the ball after a pass from sophomore Jake Marsh nearly 10 minutes into the first overtime, ending the game 3-2 Denison. The Big Red also continued their winning ways this Saturday against Heidelberg in Tiffin, Ohio. Denison took the early lead after senior Bob Casarona put one past the keeper nearly 5 minutes into the match. The Big Red were in control for the rest of the first half, limiting Heidelberg to only 4 shots. In the second half, Denison widened the lead after Miller gained control of the ball after it was deflected off of the post, ripping a shot into the Heidelberg net. Heidelberg was not able to put one past Wagner on nine shots. In all, Denison would outshoot Heidelberg 15-9 in their victory, continuing their undefeated streak. So far this season, Denison has outscored their opponents 26-6, an impressive trend they hope to continue through November. 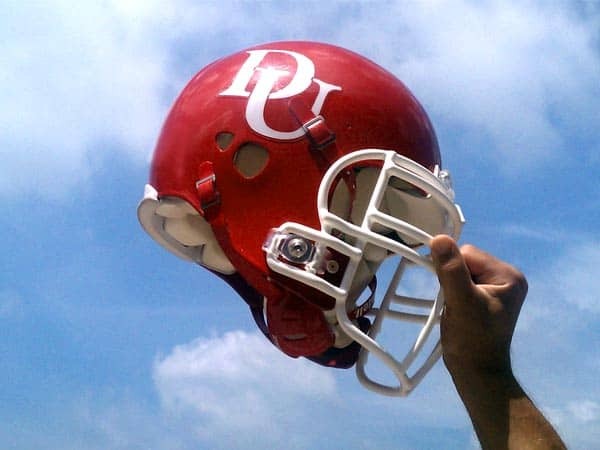 Beginning September 28 at Allegheny, the Big Red will begin conference play. They will face a number of highly-ranked teams, including Ohio Wesleyan and DePauw, who are currently ranked second and twentieth on the National Soccer Coaches’ of America NCAA Div. III National Poll. These teams will make for an interesting conclusion to the end of conference play, as Denison is scheduled to face them in their final two matches.